We’ve launched a major upgrade to the Landmarks: New York app. We’ve released version 2.0 in collaboration with the New York Landmarks Conservancy, as the Conservancy celebrates its 40th anniversary protecting the iconic buildings and diverse neighborhoods that define New York. Reduced price: 99 cents in 2013. More landmarks: the NYC Landmarks Preservation Commission (LPC) designated 25 new landmarks since the last app update, and we’ve added them all. These include several firehouses, hotels, banks, a burial ground in Queens, and the Rainbow Room. a camera option to photograph your favorite landmark and share it via Instagram, Tumblr, etc. Our Landmarks apps — for New York City, Chicago, and San Francisco — have been updated with new features that leverage iPhone iOS5 to improve your experience checking out local landmarks in these great cities. We’ve highlighted the enhancements below. 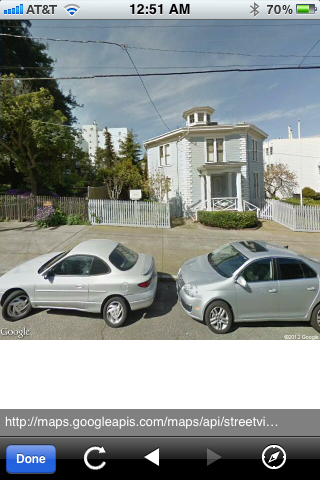 When you tap a Street View image for your selected landmark, you see a full view of the image like the examples below. (Earlier versions of the app only displayed a thumbnail image that was hard to see). This leverages Google Street View Image API, which provides an easy way of displaying an updated street-level view of any building or location in Google’s mapped database. 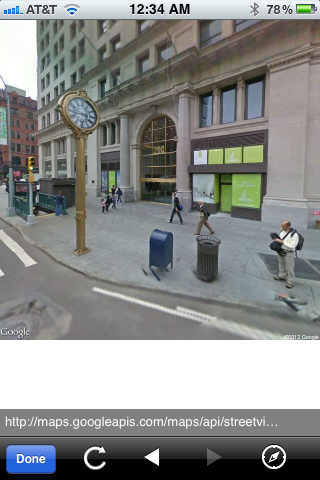 … and the sidewalk clock on 5th Ave and 23rd Street. 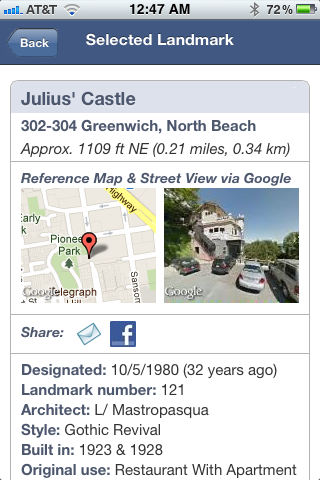 … and Julius’s Castle in North Beach. 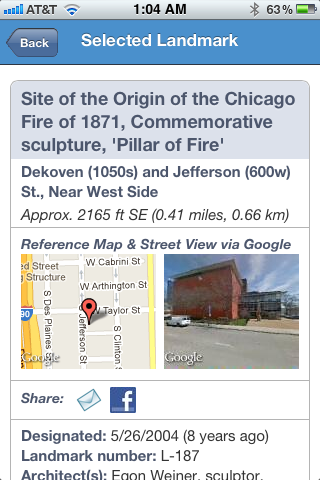 … and the “Pillar of Fire” sculpture commemorating the Fire of 1871. Once you’ve opened the large image, you can’t click on it to move around, but it should give you a great view of the landmark you’re planning to visit — and with the context of buildings on either side of it, making it easier to locate as you’re walking by. Twitter, Foursquare, and customized tours? Take a photo and post to Flickr or Instagram, and share with your local historic preservation office — especially if you see any damage to a landmark or violation of your city’s local preservation ordinance. the latest Schlitz Brewery Tied House at N. Oakley Ave.
See our earlier post about all the app’s features and rich content that you can access while exploring Chicago’s amazing architectural heritage. Locations are fixed for the Kingsland Homestead in Queens and the Hamilton Grange in Harlem (thanks to user feedback for pointing these out – please send updates/corrections if you have them! 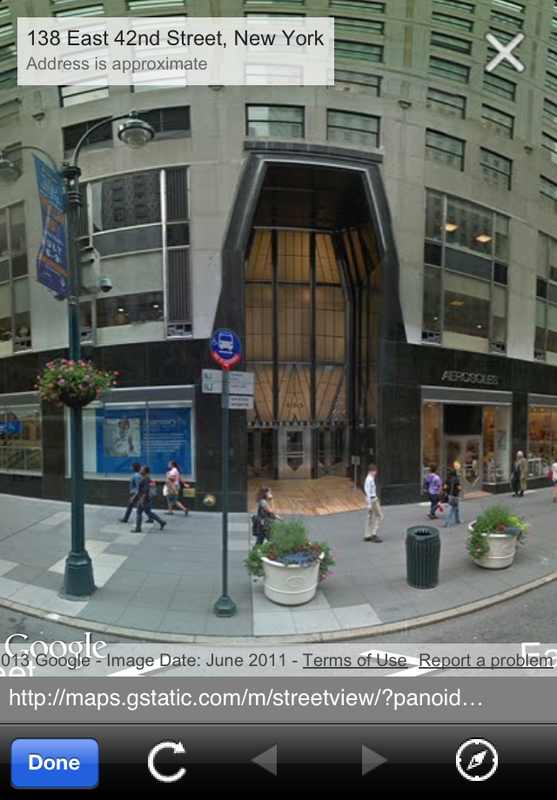 ), as well as the original Russell Sage Foundation building in Manhattan. Links to Wikipedia and to the official LPC designation reports were added for several sites. Photos from Wikipedia are included for several interesting sites, such as the Brooklyn Navy Yard Dry Dock, St. George’s Episcopal Church after its steeple crash, the Belnord Apartments, and the Mother African Church in Harlem. The links to share landmarks information via email and Facebook are easier to access – they’re included as part of each selected landmark’s description. More share options are coming soon: Foursquare and Twitter. Look for these in the next update. Updates include rejected landmarks. In September 2011 the New York City Council overturned the landmark designation for the Hardenbrook-Somarindyck House at 135 Bowery in Manhattan, even though the Landmarks Commission designated this landmark just 3 months earlier [PDF]. 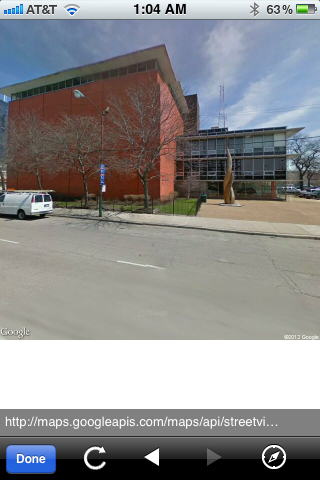 This is the 3rd landmark designation rejected by the Council since 1998. These rejected sites are now added to the app, with a note about their designation status. Visiting Chicago this summer? Want to learn more about the windy city’s impressive architectural history? 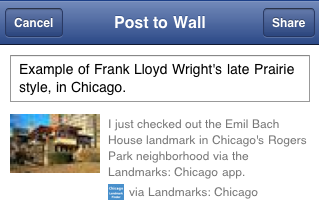 Make sure to bring your iPhone and the Landmarks: Chicago app to check out the city’s historic icons — from skyscrapers in the Loop to Wrigley Field to residential homes designed by Frank Lloyd Wright. Landmarks: Chicago lists the official landmarked buildings and sites near you (you select how far you want to search), or by address, or just by clicking on the map. There are 300 local landmarks designated by the city, so plan your walking tours now! 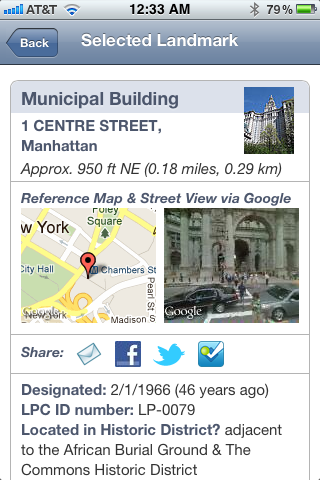 The app tells you when each landmark was designated (some as far back as 41 years! ), provides detailed info plus links to the Chicago Landmarks website & Wikipedia. It also displays thumbnail photos from Wikipedia for most of the sites, plus links to hi-res images. You can view the locations on a map, and share details about the landmark directly from the app with your friends and others. 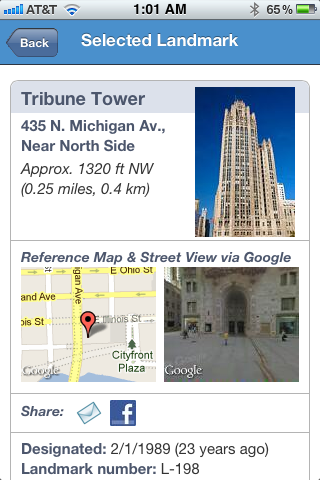 This app isn’t just about the landmarks we all know (the Empire State Bldg, etc.) It’s about ALL the major and minor landmarked properties in NYC. Within a 1/2 mile of my office, I could check out the Gorham Building, Teddy Roosevelt’s birthplace, and a whole bunch of other locations I’ve passed (and probably ignored) daily. Impress your friends and your kids with your detailed knowledge of NYC history with this cool app! I was suprised that there were were no less than 24 landmarks within just a 1/4 mile of my apartment! Just the other day I noticed a couple of interesting buildings in my neighborhood, a couple of blocks away and yep they were in there. This is a must have app for historian buffs or for folks that just want to know more about the history of their neighborhood. I only knocked off a star because the detailed information on the historic sites was sometimes buried a bit too deep in PDFs which wasn’t so great for reading on an iphone. There is some great information in there if you dig around enough to find it. The “All Points Blog” from Directions Magazine highlights the New York Times article about the app. 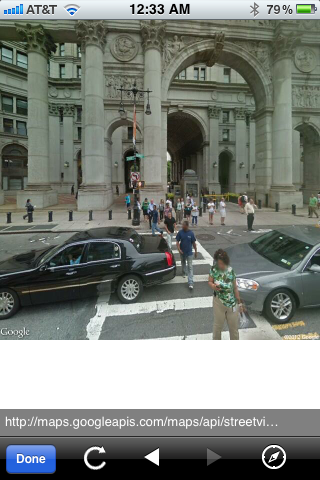 Last night I had the opportunity to demo Landmarks: New York to the Location Based Apps meetup in New York. It was a great crowd, made lots of good contacts, and the response about the app was positive. The meeting featured SimpleGeo, which is a great service for location based mobile apps. We may incorporate some features and/or data using SimpleGeo in the future. Visiting San Francisco this summer? Make sure to bring your iPhone and the Landmarks: San Francisco app to check out the city’s historic icons — from the Golden Gate Bridge to the City Lights Bookstore. 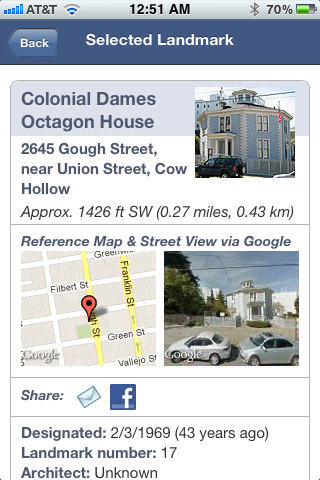 Landmarks: San Francisco lists the official landmarked buildings and sites near you (you select how far you want to search), or by address, or just by clicking on the map. There are more than 200 local landmarks designated by the city, so plan your walking tours now! 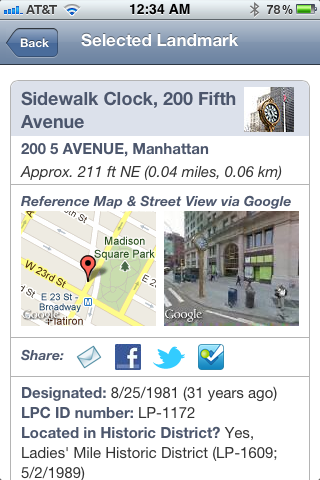 The app tells you when each landmark was designated (some as far back as 40 years! 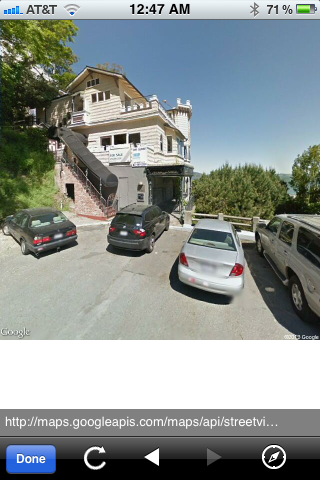 ), provides detailed info plus links to the NoeHill website & Wikipedia. 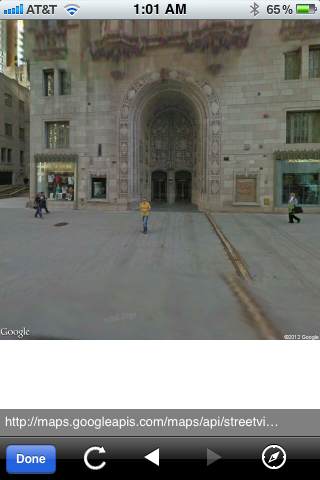 It also displays thumbnail photos from Wikipedia for more than 60 landmarks, plus links to hi-res images. You can view the locations on a map, and share details about the landmark directly from the app with your friends and others.